So, by Ms. Stanley’s standards success has nothing to do with getting elected or placed in the Baseball Hall of Fame; it has nothing to do with awards or recognitions, wealth, status or power. Even earning the pride of one’s parents and the admiration of one’s children is irrelevant. The reality is that success means many things to many people and one can both accept Ms. Stanley’s sentimental poem as profoundly true and still consider some of the other things mentioned above as forms of success worthy of pursuing. Thus, the first critical observation in an effort to make success and failure simple is that success an essentially subjective concept that can be measured by objective standards only when the end goal of an activity is clearly understood. The success of a person who wants to win an Olympic Gold Medal, be richer than Donald Trump or more famous than Kim Kardasian will look very different than the success of one who sets out to be a great teacher or surpass Mother Teresa in making a positive difference in the world. Similarly, what your father, significant other or favorite teacher envisions when they wish you to be successful can be very different than your own vision. So, what we get is terrible tension when there is a mismatch in definitions of success (as where a parent may wants/expects you to become a prosperous doctor or lawyer and you aspire to be a writer). A certain formula for discontent and unhappiness is to pursue someone else’s definition of success or to allow your life efforts to be judged by someone else’s criteria. Until you define your own goals and purposes, your life is not your own and there can be no sense of fulfillment no matter how much you achieve. Steven Covey made famous the line, “start with the end in mind.” That is wise counsel in defining success. Consequently, the first requirement in the pursuit of success is formulation of the desired end, the purpose one is pursuing. Since we are talking about your life, what other people think or want is irrelevant. So, once your goals are clearly specified, success should be judged only in terms of attainment of those goals. Unfortunately, it is more complicated. Where lots of people go wrong is they are pretty clear on what success would look like (e.g., being a prosperous and respected surgeon, raising healthy and happy children, publishing a successful novel) without any serious consideration of how one would feel. Folks with clear life goals often make the unexamined assumption is that good feelings like pride, satisfaction, fulfillment and happiness will automatically come with the achievement of those goals. Sadly, the slightest inquiry into the emotional lives of high achievers will reveal this is often not the case. Instead, people who ought to be hoisting the success trophy over their heads with unbridled joy and gratitude often are surprised at the short-lived and shallow feeling of accomplishment that accompanied their success. Thoughts like, “is this all there is” or “I expected to be happier” act like a potent buzz kill. On reflection many conclude that their success cost too much (e.g., alienation from children, a broken marriage, heart problems, etc.). Sometimes there is a feeling that the quest itself caused undesirable personality or character changes (consider the observation: “the problem with the rat race is that you are still a rat.”). And if success is achieved in a dishonorable way or in a way that alienates the achiever from people that really matter, the nectar in the victory cup is more likely to be bitter than sweet. By counseling us to be sure that the ladder of success is leaning on the right building before we start climbing it, Stephen covey warns us of the danger of choosing the wrong goal. 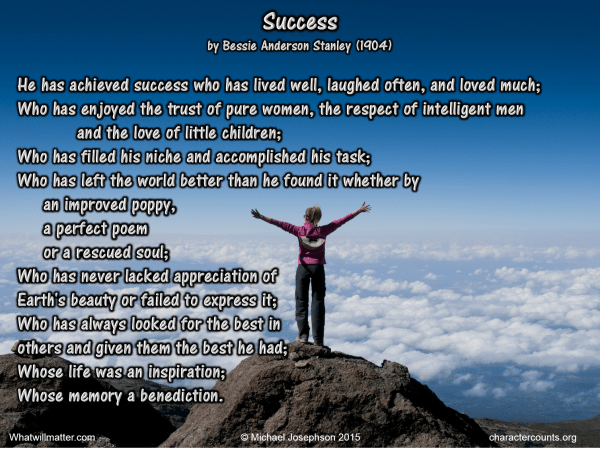 Difference between success and significance. What seemed like success when it was first achieved can actually spawn unhappiness and discontent if, in the end, the achievement does not fill your need to feel worthy. Peter Drucker pointed out that many executives who reached the top of the corporate food chain come to place less value on traditional notions of success and more value on the concept of significance. All of this highlights the importance of being both deeply introspective and totally honest about your personal definition of success. It also makes it clear that if you want to feel good about yourself and your achievements at the end of the journey you have to continually monitor your emotional progress and be prepared to adjust your course. Assuming the goal that will define your success is solid we need to identify critical qualities that contribute to success as well as the way we deal with unsuccessful results — mistakes, setbacks, frustrations, disappointments and, sometimes, deep feelings of inadequacy or failure. Let’s deal with the easy part first. What it takes to achieve success. Planning. Planning refers to identification of the short, medium and long-term objectives that must be achieved to accomplish the ultimate objective. For example, if the ultimate goal is to become a prosperous surgeon some of the more obvious instrumental objectives include getting good enough grades to be admitted to college, graduating from college with a good enough academic record to be admitted to medical school, succeeding in medical school and being admitted to a post graduate surgical program, etc. Each of these stages are themselves very significant challenges and it is possible that even with focused effort one may not achieve one of these prerequisites. Though persistence is a critical condition of success it is not a moral requirement that one persists if the goal is no longer desirable or the price to be paid no longer seems reasonable. Thus, if done for the right reasons and after thoughtful deliberation, abandonment of an ultimate goal is not only proper but sometimes wise. Effort. Of course unless one is counting on luck or has somehow rigged the system (both unwise things to do) achievement of any worthwhile goal will require effort. In fact it will often require quite a bit more effort than originally thought. Here’s where effort interacts with perseverance because it must be diligent and determined. A bona fide effort not only includes hard work but smart work. One must be strategic and informed in pursuit of success. Positivity. By and large, successful people maintain their own passion and persuade others to believe in them by their confidence. They believe they will succeed and that belief fuels their efforts even when the going gets tough. Confidence is a form of positivity. Positivity is a mindset that interprets events in a way that bolters confidence. It produces and supports optimism and hopefulness and shield us from their toxic opposites – hopelessness and pessimism. There is a mountain of evidence that positivity improves health, career success and that positive people live longer and happier lives. In a sense, positive people are inherently and pervasively successful. Perseverance. Success books and motivational quotation collections are filled with aphorisms about the power of perseverance (which also goes by the name persistence). In fact, I’ve compiled more than 100 of the best quotes at ___________________. There seem to be no dissenters from the core notion that “winners don’t quit and quitters don’t win.” Thus for hundreds of years elders teach the next generation: “if at first you don’t succeed, try and try again.” The reason living up to this aphorism is so hard is that in real life there are many reasons to want to quit, some of them are even good reasons. The problem is that too many people quit too soon because they are tired, lazy, discouraged, afraid of failure or simply distracted toward other goals. One of the most common bad reasons to stop trying is the emotional inability to cope with or a misunderstanding of the significance of missteps, mistakes, and perceived failures. I discuss this extensively below but for now it is sufficient to indicate that one’s chances of success are significantly enhanced by sustained passionate effort. It’s only logical that people who try longer and harder will succeed more often. Resilience. Resilience is a close cousin of perseverance. In some cases they seem to be the same but while perseverance focuses primarily on not quitting because of obstacles, difficulties and discomfort, resilience comes into play when you’ve really been knocked down, sometimes by a devastating failure and sometimes by some external tragedy or trauma. The essence of resilience is the ability to bounce back, to get back on the horse, and in many cases, to start over. Thus, we think of people who have lost their eyesight or a limb or someone important dies, or their fortune is lost in a global economic crash. In these cases perseverance is not enough. What’s needed is not sticking with an effort despite difficulties it is the ability to call on a deeper inner strength to absorb pain and suffering and to get over it and move on. Clearly, this character trait contributes to success because it puts the downed but not defeated person back in the game. The spectrum of inducements to quit is very broad. It includes discouragement because a task is harder than expected, impulses of laziness, loss of focus, successive rejections and failures that accumulate to kill optimism and hope to singular and spectacular public failures (an invention explodes causing devastating injuries). It requires a healthy and fundamentally objective perspective to sort through the various possibilities and make prudent decisions with the long term in mind. 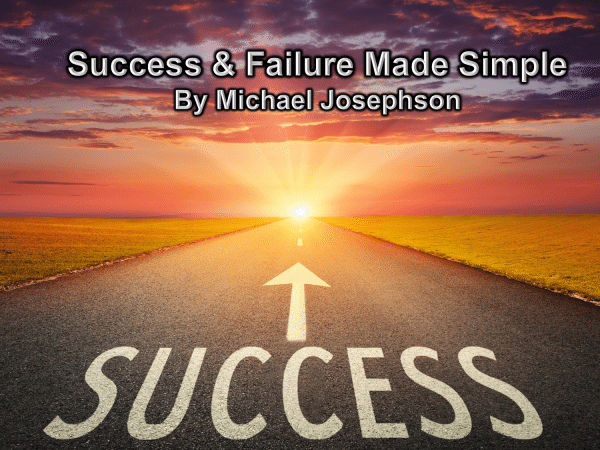 One of the best ways to create immunity from the fear of failure is to re-conceptualize what we call failure. We can begin with the observation that highly successful people make more mistakes than those they surpass. They succeed because they learn from every mistake and turn them into stepping stones. It’s not just that they try longer and harder than most, many top achievers also have a very healthy way of looking at what other people call failures so that they are able to learn from every mistake and turn them into stepping stones.